Commentary on "The Dead in Christ (1 Thess. 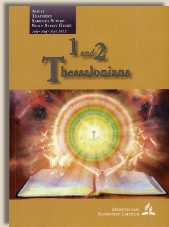 4:1318)"
The Sabbath School lesson for today covers the doctrinal stance of Seventh day Adventist’s regarding 1 Thessalonians 4:13-18. The author says that in this passage, Paul is reacting to a theological misunderstanding (error) among the Thessalonians. He says that though the error is not entirely clear, some members were definitely in distress regarding the fate of believers who died before Jesus’ return. The issue, the author says, seems to have been about the difference between those who died before Jesus’ return and those who would be alive when it happens. As Paul's epistle was opened and read, great joy and consolation was brought to the church by the words revealing the true state of the dead. Acts of the Apostles, p. 258, excerpted. The “true” state of the dead, as taught by Ellen White and the SDA church, teaches that those who die have no awareness or consciousness. Indeed, many in the SDA church believe that when a person dies, they cease to exist. The formula used is: body + breath = living soul. In other words, when the body dies, the person (living soul) no longer exists. The Sabbath School lesson, then, is not seeking to be true to what Scripture says, but what Ellen White, the SDA prophet, teaches which is SDA doctrine. Christian doctrine and SDA doctrine are in contradiction to one another. The simplest reading of this text teaches us that God will return WITH those who have died before the Second Coming. This does not address the consciousness of believers who have died before the Second Coming, however it does address existence. Through the week, we will explore what the Bible teaches regarding consciousness of those who believe in Jesus and have died, as well as the Biblical teaching of the new birth. The Sabbath School lesson teaches a doctrine which is not from Scripture, but instead derived out of a teaching from their prophet, Ellen G. White.